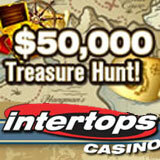 to win casino bonuses at Intertops Casino this month during their $50,000 March Treasure Hunt. As they follow the treasure trail, players will encounter mermaid guides and meet friendly island natives to help them with their quest. Those that make it to the treasure chest at the end of the trail will be eligible to win cash prizes of $1000. Intertops bonuses are designed so that players of all types have a chance to win. Just by playing any of the 300 casino games at Intertops, players automatically earn points and are ranked in six levels based on their deposits, wins and losses. On April 3rd, random draws will award prize money to players on each of the six levels. Three players that have played enough to reach the sixth level will even win $1000 each. Players have until April 1st to accumulate points and can check the online scoreboard any time to see their current points and where they rank. Launched in 1998, Intertops Casino is one of the first and still one of the most trusted online casinos in the world. It has an incredible selection of online casino games and is known all over the world for its attentive customer service and easy deposits and withdrawals.